Helps develop critical evasive driving skills. Teaches emergency situation prevention through situational pre-planning and hazard perception skills. (1) 16-Minute DVD - Combines engaging video and editing technology with expertise from industry professionals at all levels. 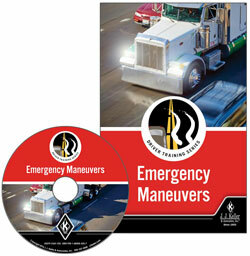 (1) Trainer Guide - Product Code: 45591 (862-H) - Provides information on how to develop, organize, and conduct effective emergency maneuvers training sessions. (10) Driver Skills Cards - Product Code: 45597 (922-VC) - Recaps the key points from the training program and serves as a reference tool for drivers to use either before or after the training session.